Our first national competition of the season kicked off with a bang, with more than 1,200 people coming together at the Novotel Hammersmith in London on 11-12 April to celebrate the impact made through entrepreneurial action. We often say that what makes Enactus events special is bringing together students, academic and faculty leaders for competition, collaboration and celebration, and the UK event was a perfect example of that. In the competition, 39 universities took part in the three rounds in hopes of being named their country’s national champion. Throughout each round, social ambassador James Howell from partner company graduate jobs did an amazing job of highlighting the work of each team, sharing with the country and the world the difference Enactus UK teams are making in their communities. These efforts were supported by alumna Ishita Ranjan who managed the Enactus UK Alumni accounts over the two-day event. 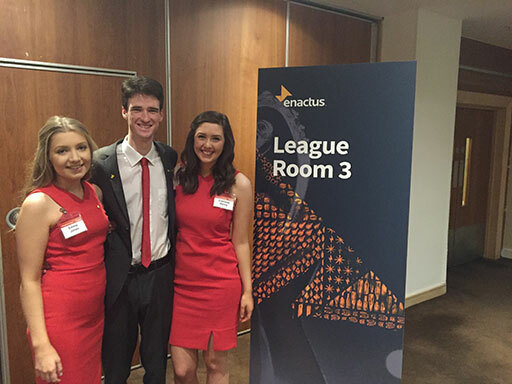 After two tough rounds judged by nearly 230 executives, five teams were named finalists: Enactus Southampton was up first and shared their work setting up a social incubator, addressing access to clean water, and improving 30,000 lives. Next came the team from University of Sheffield who worked directly with refugees, empowering them at home while enabling them to improve lives in Malawi. Enactus Durham was third and shared their Solar Solutions and Planting Change projects, both of which use natural resources to create sustainable solutions. The team from the University of Nottingham helped social housing tenants in their community save over £20,000. And the last presentation came from the Enactus team at the University of Edinburgh, a first time finalist, who worked with single mothers. Tweet after tweet was posted during the final round, with updates from Enactus UK and the Enactus UK Alumni group, as well as messages of excitement and awe from those in the audience. 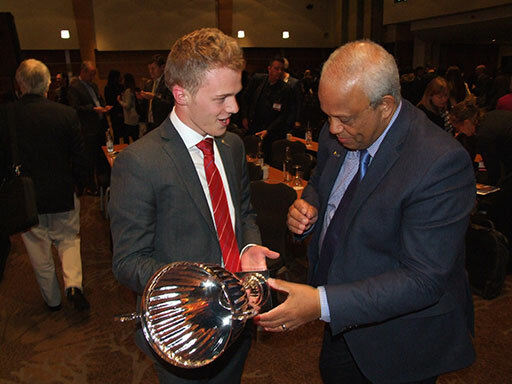 In the end, after what was sure to have been a difficult choice for the 68 final round judges, the team from the University of Nottingham was named the 2016 Enactus UK National Champion, earning the right to represent their country at the Enactus World Cup this September in Toronto. Judges were impressed with the impact they made, including their Recovered project, a furniture recycling social enterprise that provides employment for the long-term unemployed. Collaboration was evident at special sessions throughout the event: there was a forum for university advisors, facilitated by Lord Michael Hastings, Head of Global Citizenship for KPMG, that provided a platform for best-practice sharing on the topics of how universities and Enactus can work better together on campus and how universities can best support teams in identifying social enterprise opportunities. There was also a forum for business advisors to discuss strategies for supporting a team as well as how to attract students to their organizations. Team leaders had the chance to meet directly with final round judges during a special reception, providing both groups a unique opportunity to network and share ideas. And there was also an impressive Project Fair, where all teams were invited to set up a booth showcasing their projects from the past year. Attendees had the chance to visit with students at each booth to learn more about their school, team and initiatives, as well as discuss ideas and solutions. And in true Enactus spirit, there was a competition tied to the fair, sponsored by Tesco and won by Enactus Essex. If there was a theme to this year’s event, one would guess it was celebrating because there were so many examples of recognizing the amazing impact the individuals involved have had this year. All of the Enactus team leaders were recognized on-stage during the opening ceremonies, with four individuals being named Team Leaders of the Year. Numerous other individual recognitions were made including Outstanding Contribution, Alumni Mentor, Faculty Advisor of the Year, and Champion of Enactus. Thanks to the support of partner companies, teams were recognized for their work in various focus areas such as Ford C3 Building Sustainable Communities awards, AIG Wearable Technology Award, and the KPMG UK Unlocking Potential Award. As a final treat, attendees had the chance to hear about leadership and endurance from keynote speaker Sir Ranulph Fiennes OBE, known as one of the top 20 speakers in the world and described by The Guinness Book of Records as “the world’s greatest living explorer”. 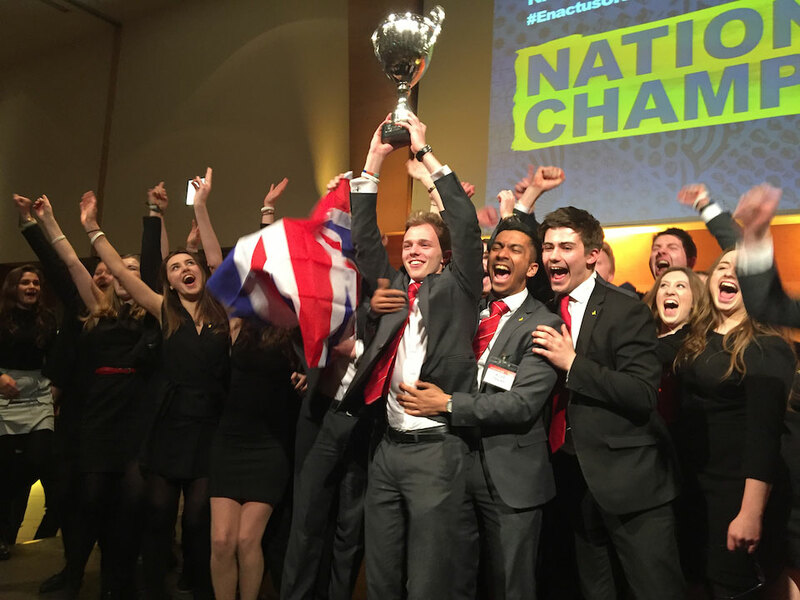 Believe it or not, there is more to share about this amazing competition but we’re out of room: check out #EnactusUKNationals on Twitter to experience the excitement and emotion of those two days. If the first national competition is any indication, we are in for an incredible season! Make sure you are following us on Facebook and Twitter so you don’t miss any of the action.